The Billionaire's InboxAmerica's titans of industry and political influence, in their own words. The governor’s office invited a select group to the table to negotiate with the oil company, away from more visible input. After all, Forest Service initiatives can get messy. With an issue as heated as this, the public comment period would have been full of competing interests. As the then-State Planning coordinator Ryan Lance notes, a lot of people with “large investments” in the area had concerns about where the company would drill. Of the four stakeholders at the table in early meetings at the governor’s office, two were associated with Joe Ricketts. “Your funding of this campaign has bought you a seat at the negotiation table,” Knuth wrote to Ricketts in an email. “This arrangement offers you the best of all worlds in having representation/supervision of the process” while remaining unnamed. As the Forest Service naively drafted an impact statement and some environmental groups protested the oil company, at least two final settlements were drafted behind closed doors: One by a handful of local organizations; another confidential addendum between Plains Exploration and Joe Ricketts himself. The latter agreement removed two wells in the vicinity of Ricketts’ property and ensured specific parcels across from his ranch would remain untouched. The road leading to his ranch would additionally be off-limits to the company’s trucks. When the settlement with the oil company was made public in 2010, a day after the Forest Service issued its report, it pledged support for the remaining 136 wells, and Ricketts’ name was nowhere to be found. Some were baffled by this surprise negotiation of a private deal. Two years later, Ricketts donated, this time in public, $1.75 million out of the $8.75 million needed by the Trust for Public Land to buy out the remaining oil and gas leases in the valley. Today, Ricketts’ website highlights his conservation efforts in his adopted state, including loon restoration at his ranch. Wyoming still ranks fourth nationally for natural gas and oil production, just not in the area where the billionaire lives and entertains. Reed is adamant that the work he did with Joe Ricketts was “not some NIMBY situation” weighted to give preference to the conservation of the areas surrounding the billionaire’s ranch. And it’s true that Ricketts’ personal interests were nestled deep within a broader and much rosier campaign. A year after the sale, motivated by the idea that the valley would be “pristine forever,” Ricketts began to explore a land exchange with the Forest Service to expand the boundaries of his property into the pine woods he’d helped save—the conservation deal, he wrote an employee, had inspired him to think about constructing a luxury spa and hotel. He was thinking about becoming a citizen of New Zealand, he added. Ricketts went on to donate $12.5 million to the PAC he created, $10 million of which was spent towards the election of Mitt Romney, a candidate who didn’t have Ricketts’ conservation concerns and had promised to double the number of drilling permits issued for federal lands. Romney lost and Ricketts never moved away. He remained in America, influencing elections. An estimated 560 billionaires live in the United States, more than in any other country, and collectively they control a greater share of wealth than the bottom 60% of the American population. Only a handful of these 560-odd people do things that land them on the covers of magazines. Tom and Judy Love, the founders of the ubiquitous Midwestern Love Travel Stops, have a higher net worth than Jack Dorsey—but they don’t tweet. Like many wealthy people who prefer to remain obscure, Ricketts sequesters himself in communities populated by like-minded people and negotiates perceptions of his influence through a team of PR professionals, lobbyists, and consultants. But to the important people—the people who desire the political capital his wealth can buy—he’s quite well known. Grover Norquist grovels for money and the Illinois governor invites Ricketts for cigars and motorcycle rides. The billionaire has taken enough meetings with Mitch McConnell to be friendly, and has given Paul Ryan his personal thoughts on the budget deficit over dinner. During the 2016 election, Ricketts and his wife poured donations into anti-Trump Republican efforts, only to make a “stunning” about-face and pledge at least $1 million to the future president’s campaign. This endorsement was rewarded when one of his sons was offered a position in the current administration. Ricketts doesn’t have to be the richest man in the country to influence policy. He just has to be one of the hundreds of people with enough wealth and motivation to purchase an amplified voice. In that way, and in his policy positions that favor his own interests, he is very much representative of the undercover donor class. Ricketts doesn’t appear to believe American laws should inconvenience him, or that his actions should be of interest to anyone but himself. In emails to friends and associates he has centered his needs as a businessman, denigrating the “welfare society,” regulation, and taxation. When the IRS comes knocking, he serves them warm bison and mediates an agreeable deal; when his employees vote to unionize, he shutters the business the next week; when one of his smaller personal enterprises hires too many employees, he shuffles them around to avoid federal discrimination laws. Even the prospect of establishing a “family bank” for the personal use of his dynasty was scrapped when Ricketts discovered the entity might be subject to oversight from the SEC. In a family document from 2009, produced as a prompt for discussion among his children—who include the Republican National Committee’s finance chairman, the governor of Nebraska, and the owners of the Chicago Cubs—Ricketts wrote that “wealthy people are a basic foundation” to a successful society, given their critical generation of wealth for charity and their role in creating jobs. “These people are a necessary part to make societies function appropriately,” he wrote. Yet when I started reporting on Ricketts late last year, it seemed few people outside of the finance and media industries knew much about the patriarch who considers himself one of American society’s foundational figures. This is, of course, by design. Joe Ricketts made tech money before tech money was fashionable, and he made it too late in life to get swept up by a press dedicated to boy wonders. His business, at the intersection of securities trading and the internet, grew directly out of the deregulation of brokerage firms in 1975. Until May 1, 1975, a fixed rate determined trading fees, but that May Day those rules changed, creating an entire industry of discount stock brokers. Ricketts’ business, First Omaha Securities, opened that year, promising cheap trades over a toll-free number. Ricketts’ $12,500 initial investment in the business was quickly recouped. He was 34. A year after, Ricketts’ firm handled 21,000 trades a day and the Nebraskan became, at age 57, an extremely wealthy man. He appeared on Forbes’ list of 100 richest Americans for the first time in 1998, in an issue that took particular note of the growing number of American millionaires under the age of 45. Ricketts, meanwhile, was nearing retirement age. Omaha, NE, where Ricketts headquartered his company and where his family lived, is a good place to be rich and relatively unknown. In 2000, Ricketts started to pull back from his role as the sole CEO of Ameritrade (he remained as chairman) and joined the board of the American Enterprise Institute. He was estimated to be worth $1.8 billion, much of it in Ameritrade stock. He did not enjoy retirement, and soon looked for new ways to amuse himself. In the early 2000s, Ameritrade acquired a number of other firms in an attempt to counteract the effects of the dot-com bust. Reportedly, this made the company more money in a few quarters than it had generated in the previous 28 years combined. Ricketts’ net worth, accordingly, continued to climb, swelling another 300 million by 2004, the year he turned 64. When Ameritrade took over TD Waterhouse, another firm, a year later, Ricketts received $536 million in dividends. In 2004, after a trip to climb Mt. Kilimanjaro and an inspiring chat with a local teacher, Ricketts also founded a charitable educational initiative to fund schools in his area. His brother Jim eventually helmed the business. Over the years, Joe Ricketts appears to have considered offshoots of the original concept, including a program to bring conservative programming to “motivated students” in the “U.S. ghettos,” but the idea appears not to have gotten off the ground. As Ricketts foregrounded his ranch and his livestock as his central business interest in public, he also quietly formed a company called Preeminent Global Experiences to buy up properties in luxurious destinations across the world. Around 2006, a company called CIEL sent around material to a small list of influential people announcing its soft launch. The Ricketts are longtime members of the Yellowstone Club, an exclusive Rocky Mountain ski and golf resort where homes start around $5 million. (The family owns two chalets there.) Initiation fees run around $300,000. Members include Ben Affleck, Bill Gates, and Justin Timberlake. Joe Ricketts embarked on a similar endeavor of global scale, promising life-altering vacation experiences to a member group capped at 100. Between his media endeavors and his son Pete Ricketts’ foray into Nebraskan politics, the family name began to appear in the press with some regularity. In 2009, when Ricketts used a trust administered by his children to purchase the Chicago Cubs, the local press began to publish explainers and profiles on this family that had somewhat mysteriously appeared on the scene. Internally, the family agreed on tight talking points. In the years following, Ricketts and his right-hand man, Alfred Levitt, used the transfer of wealth to his children for the Cubs to negotiate a lower valuation of his net worth for the public’s consumption. In what Levitt referred to in an email as an “annual discussion” with Forbes around Ricketts’ inclusion in its list of richest Americans, the Cubs and Ricketts’ wife’s stocks in Ameritrade were left out. He didn’t appear on the Forbes 400 again until 2014, after he’d garnered significant press for his role as a major donor to Republican federal causes. The baseline net worth for entry onto the Forbes 400 has inflated nearly every year since it was launched in 1982. In 2006, the cutoff was a billion dollars. In 2018 the minimum net worth was $2.1 billion. Perhaps shielded by other, vastly richer billionaires with flashier endeavors, Ricketts continued his activities in relative obscurity. 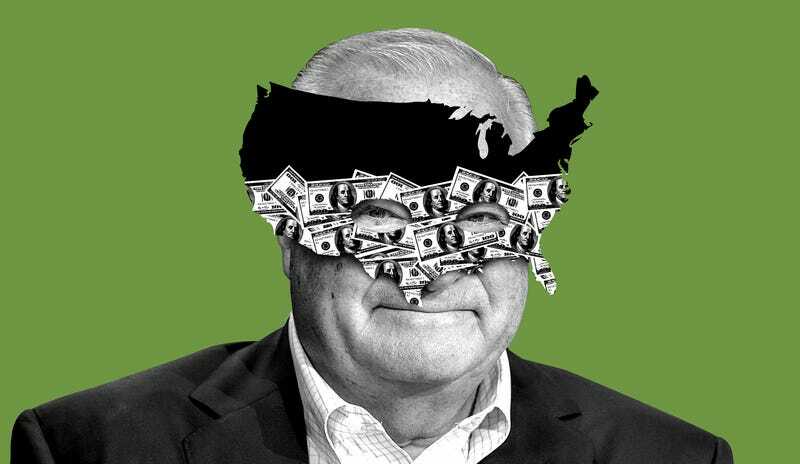 During election seasons, the political press gives the public a quick refresher on Joe Ricketts when a racist ad campaign his PAC considered leaks, or when Trump tweets about his donations. And despite his apparent wishes, he has appeared on the Forbes 400 for the last two years. Joe Ricketts hasn’t given many substantial interviews in recent years; he prefers to direct curious parties to his website, in order to protect himself from “erroneous information,” as he once wrote a friend. On JoeRicketts.com he describes business investments in specialty food products and the low-fat, low-cholesterol bison burger, as well as the company Cloisters Domestic Products, which sells loaves of bread to offset the cost of his newest business, a silent religious retreat in Nebraska. The site also lists the Ricketts Art Foundation and restoration projects to benefit bird species. Blog posts written under his name address opioid addicts (“bankrolled by our tax dollars”) hamburgers (man’s “greatest invention”) and Trump’s stance on China (“a measure of strength and resolve”). Ricketts’ true feelings about politics, or nature conservation, are nearly impossible to divine from outside the tight circle he’s created, the parallel world of private chalets and Washington restaurants where people who make their own rules meet. With enough money, most anyone can launder their true feelings into something that looks innocuous or noble. Our country is full of people like Joe Ricketts, whose immense private authority evades public accountability by design. And really, the problem isn’t Joe Ricketts, whose ideas about business and government appear to come from the idea that anyone could, with less regulation and lower taxes, end up like Joe Ricketts himself. It’s that guys like him can exist at all, skirting laws and determining the country’s political future based on the hunch that the way they lived their lives was more correct.